All-Ireland champions Tyrone's first day out in the 2006 championship proved a dismal one as Derry dominated proceedings in Omagh, winning by 1-08 to 0-05. Without the attacking threats of the retired Peter Canavan and injured duo Stephen O'Neill (hamstring) and Brian McGuigan (broken leg), Tyrone looked a shell of themselves and their wait for a first Ulster title since 2003 continues. Losing full-forward Kevin Hughes to a straight red card after only 17 minutes was a telling blow, but the Red Hands simply did not turn up on the day. 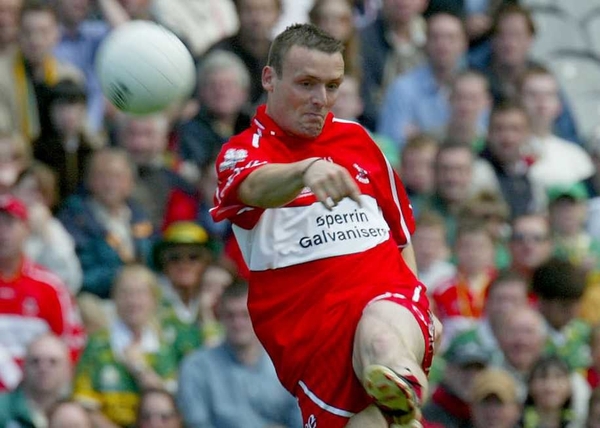 Captain Brian Dooher and 2005 hero Eoin Mulligan hit some glaring wides – it took a full 38 minutes before substitute Joe McMahon opened Tyrone's account – and manager Mickey Harte's woes were compounded when centre-forward Sean Cavanagh was carried off with a suspected shoulder injury. Credit to Derry though, their win – their first Ulster championship triumph over Tyrone since 1997 – was a fully deserved one. Their full-forward line of the Bradley brothers, Eoin and Paddy, and Enda Muldoon (1-03 (3f)) were a constant threat. They hit 1-07 between them with wing-back Joe O'Kane firing over Derry's other point. From the moment that Bellaghy giant Joe Diver gathered at the throw-in, Derry were in control of the first half – they ended it 0-06 to no score in front. Diver and skipper Johnny McBride drove them on from midfield and former All Star Muldoon landed three of his four frees to put the Oak Leafers in front. Mulligan and his marker Kevin McGuckin were both yellow-carded with just 82 seconds on the clock, but when the game settled down it was Paddy Crozier's men who looked the more polished. Paddy Bradley scooped up a low ball to left-foot them into the lead in the fifth-minute. The energetic Barry McGoldrick won a free for Muldoon to ping over two minutes later. Muldoon (free) and Eoin Bradley added further points as Tyrone looked a shadow of their 2005 side. Midfielder Peter Donnelly and Mulligan skewed shots wide and the Tyrone mood was darkened further when Hughes was dismissed for a punch to the stomach of Liam Hinphey. Another McGoldrick run allowed Muldoon to point his third free for a 0-05 to no score lead. As the half ticked on, Tyrone tried in vain to open their account with Dooher, Mulligan and Donnelly – from a '45 – all firing wide. Derry defender O'Kane rubbed their noses in it when he collected a Muldoon pass to point and put six between the sides for the interval. After Paddy Bradley had tagged on a free for Derry in the opening moments of the second half, Tyrone sparked a mini-revival with McMahon and Davy Harte, the nephew of manager Mickey, kicking their first points. But Tyrone were lacking rhythm and frees that O'Neill would usually clip over were being missed. The 28-year-old Muldoon put Derry in match-winning territory when he found himself unmarked on the edge of the square in the 48th-minute and netted past Pascal McConnell. Paddy Bradley shrugged off the tackle of Ryan McMenamin in the build-up and McGoldrick squared it to Muldoon who left-footed to the net for a 1-07 to 0-02 lead. The game petered out with the injury to Cavanagh, sustained in a challenge on Diver on the hour mark, adding six minutes of injury time. Mulligan, with two frees, and Donnelly, from an injury time '45, added to Tyrone's tally but those scores were meaningless. Paddy Bradley bagged his third point – second from play – on 69 minutes to seal Derry’s passage through to an Ulster semi-final against Donegal or Down (June 18). TYRONE: P McConnell; R McMenamin, C McGinley, C Gourley; D Harte (0-01), C Gormley, P Jordan; C Holmes; P Donnelly (0-01 (1 '45)); B Dooher (capt), S Cavanagh, R Mulgrew; R Mellon, K Hughes, O Mulligan (0-02 (2f)). DERRY: B Gillis; K McGuckin, K McCloy, F McEldowney; L Hinphey, P McFlynn, J O'Kane (0-01); J McBride (capt), J Diver; M Lynch, B McGoldrick, F Doherty; E Muldoon (1-03 (3f)), P Bradley (0-03 (1f)), E Bradley (0-01).